Villa Magaliesberg provides Bed & Breakfast accommodation of choice, cradled beneath the majestic Magaliesberg mountains in Schoemansville, Hartbeespoort, South Africa. We're about an hour's drive from Johannesburg International Airport and thirty minutes drive from Pretoria. We offer comfortable and luxurious accommodations. Villa Magaliesburg is ideal for business and leisure travellers. Our villa is also handicapped-accessible. Hetta Cross, our manager, extends a warm welcome to our guests. Hetta has extensive experience in managing Guest Houses in the Cape Town area. Her passion for being the best hostess is well known among those who know her. Hetta provides excellent cuisine and sees to our guests' needs. Children and families are always welcome at Villa Magaliesburg. Enjoy the lush private garden from the balcony, relax by the poolside, or take a refreshing dip in the pool! The villa offers an outdoor BBQ area and terrace that accommodates larger outdoor parties. 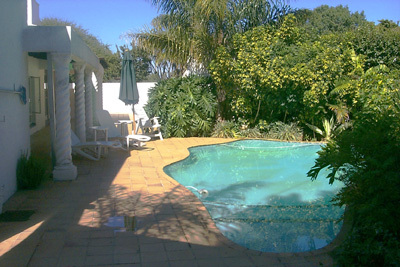 We have recently added a Self-Catering unit. Since it's opening in April of 2003, it has become quite popular for those guests who have children and or party of more than four people. 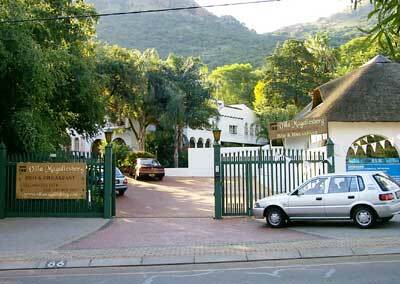 Villa Magaliesberg offers ample parking space which is gated, for our guests security.